Warm up your vocal chords because the 37th annual Brussels International Fantastic Film Festival arrives on April 9th. The storied genre film festival in Belgium will host ten world premieres, eleven international and ten European premieres over the course of two weeks. Leading the way are Hollywood heavy hitters like the new Hellboy and Pet Sematary films. The already divisive film Dragged Across Concrete will stop by the fest. Then there are fest circuit faves like One Cut of the Dead, The Unthinkable and The Witch Part 1: The Subversion. There is a lot more information over at the festival website. Check it out! It is a sociological fact that fantasy and horror cinema always enjoy a renewed interest from audiences and critics in times of social and economic turmoil. Needless to say, the harvest is particularly rich in the current international climate! Italy comes up with not only extremists who seek refuge in an asylum centre (GO HOME), but also fascism incarnate (Il Duce Mussolini himself) making a comeback in the twenty-first century (I’M BACK)! The Scandinavians focus on cross-border terrorism (THE UNTHINKABLE) and climate disasters (THE QUAKE). The Koreans threaten to unleash the Third World War (TAKE POINT) while the Americans try to come to terms with their multiple mass murders (THE DEAD ONES). For those who persist in believing in mankind, do not panic! 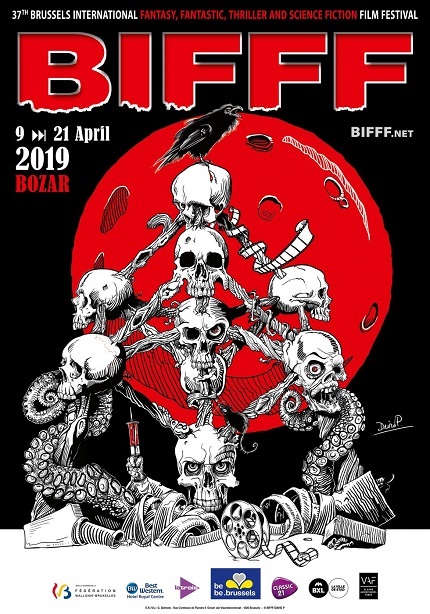 The 37th edition of the BIFFF has a lot of big guns at the ready: PET SEMATARY, HELLBOY, IRON SKY 2 (THE COMING RACE), GRETA, ASSASSINATION NATION, THE BEACH BUM, DRAGGED ACROSS CONCRETE, and LITTLE MONSTERS. In total we will screen 97 films: ten world premieres, eleven international, and ten European premieres, with a selection that will take you to the far corners of India and Thailand! There is also news from the home front, with nine Belgian feature films or co-productions, including THE ROOM (with Olga Kurylenko and Kevin Janssens), PLAY OR DIE, EXTRA ORDINARY, and THE HOLE IN THE GROUND. Among the numerous novelties is the very first ZOMBIFFF RUN, during which the participants run the risk of being eaten alive in an apocalyptic setting in the heart of Brussels! Another delicacy for demanding film lovers is the NANARLAND screening, a delicious double bill with SAMURAI COP and TROLL 2. Nostalgic souls will be delighted by the return of rafting-on-a-sea-of-humans, in collaboration with the Magic Land Theater. ’Nuff said! The rest of the program you’ll have to discover for yourself!